The Leonberger Club was established in 1988 and became a member of CMKU and FCI at the same time. Nowadays it associates agprox. 800 owners, breeders and admirers of Leo dogs. Four Club bulletins are mailed over to the members every year. Four times a year the Club organizes presentations of young dogs, breed examinations and breed male dogs show and twice a year a three-day Club meeings are hold at various places around the country. Besides, the Club gives two Club shows every year. The breed is controlled by the Chairman of the Breeding Committee. Presentation of a young individual and participation at a national, internadonal or at a Club show are compulsory for the breed examination. A breed candidate has to pass the HD test (displasya test). Degree 2/2 is accepted as the worst level. Every litter is inspected, without such an inspection no puppy can be sold. Every puppy has to reach weight of 7 kg at the end of the 7th week of life. No extemal defects and variations from the Standard are permitted. Only a member of the Club is entitled to receive the pedigrees. Breed male/female has to repeat the breed examination after 3 years. 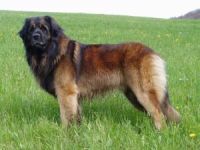 New era of the Leonberger dogs in the Czech Republic opened by importing a breeding pair from the former East Germany in 1979. Imports then successfully continued during the 80�s, almost all came from East Germany, the rest from the Federal Republic of Germany and France. The first litter was born in 1984. Of course, from the breeding point of view this created a problem resulting from blood relationship. Quality of the breed improved when Benji of Hirschalde and Alf of Avalon were brought from Germany as new breeding males. Thier contribution to the race quality was excellent and the Club now appreciates many of their descendants being chaimpions and interchampions. Now new animals have been regularly imported from abroad bringing new blood into the Club breeding. At the time being, there are 80 - 90 breeding dogs (sires) and about 30 breeding females in the Club breed. Of course, they are not used regularly. Basically, our Club has adopted and follows strictly the breeding rules issued by the FCI and EMKU and recommendations of the Leonberger Union. The breed has been managed and supervised by the Chairman of the Breeding Committe who is responsible for compiling the best breeding parents. Every litter is inspected and assessed by the Chairman or her substitutes and pupies with faults excluding them from being bred are marked non-breeding in the Pedigree. All the faults and deviations from the Standard are carefully recorded to prevent putting such inproper couples together again. Pupies should be sold at the age of 50 days, not earlier. No exceptions are made. After inspection a written report is issued with a short description of the litter. The breed being managed, only a member of the Club may receive Pedigrees on the litter. On the average 300 pupies are enlisted in the Stud Book every year.